Yes, even foods work best in teams! Iron and Vitamin C — Iron is an essential nutrient. But there are two kinds; one (heme) is found in meats and seafood; the other (nonheme) is in dark leafy greens, chickpeas and other plants. The down side, nonheme isn't as easily absorbed by the body—which is where vitamin C comes in. Foods high in C (like citrus, bell peppers, and strawberries) raise the acidity of the intestines, allowing nonheme to be more readily absorbed. 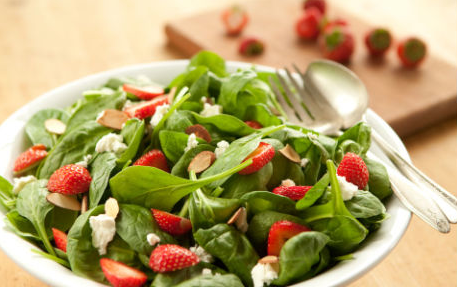 So next time, drizzle lemon vinaigrette on a spinach and strawberry salad. Or add chopped red bell peppers to chickpeas for a side dish. At meals where you're mixing iron and C, try to avoid tea, whole grains, and dairy products—all of which inhibit nonheme-iron absorption. Lycopene and "Good Fats" — Lycopene is a powerful antioxidant, believed to help prevent heart disease and certain cancers. It's also the pigment that gives red-tinted fruits and vegetables—from tomato to watermelon—their bright color. Because lycopene is fat soluble, the digestive tract is able to absorb it best when it's accompanied by fats. Researchers at Ohio State University found that when subjects ate tomatoes and avocados together, they absorbed 4.4 times more lycopene. So next time, pair red produce with items containing healthy, unsaturated fats. Salsa and guacamole make a terrific pair — not to mention, bruschetta topped with chopped tomatoes, garlic, and olive oil. Sulforaphane + Selenium — These nutrients are both anticancer crusaders. Sulforaphane is a plant compound in cruciferous vegetables (cabbage family of vegetables such as broccoli, cauliflower, brussels sprouts). When it enters the bloodstream, it can inhibit the growth of tumor cells. Selenium on the other hand, is a mineral found in fish, meat, eggs, nuts, and mushrooms; it binds with proteins in our bodies to make antioxidant enzymes, which protect us from free radicals. Research has shown that together, they are up to four times more effective than on their own. 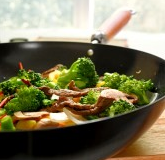 So next time, go ahead and make a classic beef and broccoli dish. Or make roasted brussels sprouts with crushed Brazil nuts, which are an extremely rich source of selenium.